Adium 1.3.6 is now available. It includes an updated version of libpurple which fixes the vulnerability revealed earlier this week which has the potential to allow another user to run code by sending you a specially crafted message over the MSN protocol plus many Yahoo regressions from 1.3.5, one of those being the problem where Yahoo contacts had signed off still appeared as online. 1.3.6 also features an updated version of the Facebook chat plugin, fixing a number of issues, which were present in Adium 1.3.5 including unwanted email notifications, dropped messages and missing contact icons. We therefore strongly recommend you update! Meanwhile, work continues on Adium 1.4, the next major release, with tons of progress so far. You can join Adium 1.4 beta testing by enabling ‘Update to beta versions when available’ in your current version of Adium or by visiting the beta page. Why wasn’t version 2.6.1 of libpurple used instead of 2.5.9 for this release? Too many features/fixes to verify proper integration? Now Pidgin support video/voice chat, will it include in Adium 1.4? Why I still cannot connect to QQ?? Have the older versions compatible with Panther and jaguar been updated to fix the vulnerability? Stew: Because 2.6.x is a much larger release and would require way more testing of 1.3.6. Remember that 1.3.x are only fix-releases, not new feature-releases. Ilun: There’s a post about that on the blog. Adium still crashes for me when I activate my msn account. Where do I send reports or how can I help? What’s the situation in Adium with regards to the latest libpurple security alert (http://www.coresecurity.com/content/libpurple-arbitrary-write)? Silly me.. should’ve mentioned that I’m running 1.4.8b – is there a 1.4 beta release that deals with the libpurple issue in the works? Yes, b9 is around the corner but please ask these questions on the forum not here in the comments. I’m new here and I appreciate your work and your program. I wanted to ask if there is a possibility, or there will be, to add color nicknames such as MSN software. I loved this opportunity and I’d like to know if I have or may in the next release. hey guys i have a doubt, im changing from msn to adium and i really liked so much but is it possible to draw in the adium just like in the msn?? and another doubt, how can i save the emoticons i want to my gallery of words with emoticons, and how my friends with messenger can see my emoticons?!!! can somene help me?? I’ve been using Adium with a lot of fun, but for some reason MSN refuses to connect a lot. When running tcpdump I found out packed I received couldn’t pass the checksum resululting in the connection problem. I’m planning tot test if it’s an internal network problem or an Adium problem tonight; i’ll update you all. For the rest: I love it, it beats MSN For MAC bij 100x. Thanks for doing some research. 🙂 Please take it to http://developer.pidgin.im/ticket/10023 (given that is the issue you are referring to) as it’s the Pidgin guys who have to fix the connection issues right in libpurple (what is libpurple? : http://trac.adium.im/wiki/LibPurple). Same as shaul – cant mount the DMG – there is some kind of an err..
Hi all, have U got prevision to implement a plugin 4 twitter? Is Adium for the iPhone in the works? I would pay money for it. 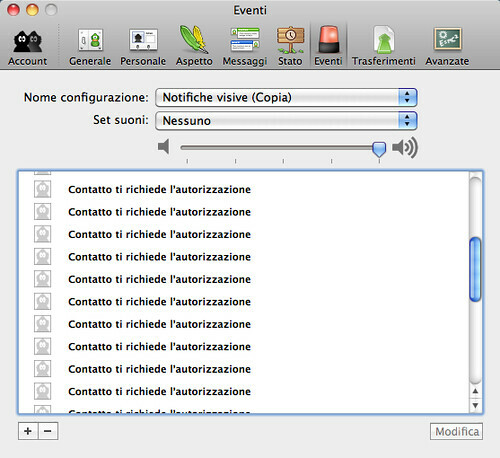 There are two or three bugs in the 1.3.6 associated with Snow Leopard. Please check links with screenshots. When i’m going to modify visual notification about a contact, this appears. I also think that as a message theme…. You guys at Adium should make a HUGE 96x Icon for messaging so people can actually see who they are talking to icon wise. Since you can customize your icons to pictures most people [me included] like SEEING who we are talking. This is an idea. Wouldn’t be great to have an account in Adium of the Chat portion of Skype? With the new yahoo mail (ymail.com) how do I set up Adium to use yahoo messenger ? There’s still a huge bug with a contact list. 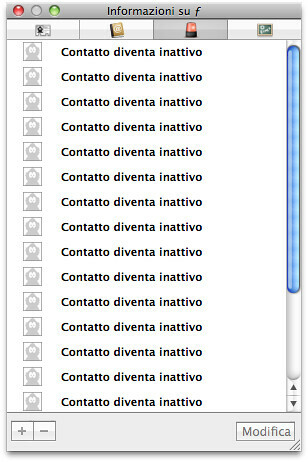 After aproximetely few hours of usage 3/4 of my contact list dissapear. After relounching the app they reappear and then dissappear, and so on so on. Adium’s contact handling is overally horrible. Contacts are often likely to be lost, their names are forgotten, combined contacts like to uncombine without any purpose. Arghh Horrible. Will it be ever repaired? I would never do this usually but i’m really proud of the xtra. Anyone else not able to connect to ICQ today?